How to receive DTT Signals & How to Install DVBT2 System? As you know Doordarshan stopped old analog traditional transmission in main cities. So from now if you want to watch Doordarshan National channel or other Doordarshan channels like DD News, DD HD, and other TV channels then It requires ordinary antenna (indoor or outdoor depending upon your location) as used in analog terrestrial TV. But now with the existing TV set, a DVB - T2 Set Top Box is required. Some integrated Digital TV sets (iDTV) are available in the market having an in-built set-top box or DVB-T2 tuner. Only an antenna to be connected to the TV set for watching DTT (DVB-T2) channels. DVB-T2 (DTT) signals are typically broadcasted by big TV towers (like TV towers for analog reception) on VHF or UHF frequencies over the air. DVB-T2 signals can be part of the VHF or UHF spectrum. So many countries are moving to this new technology due to its high-quality digital picture quality and digital sound. Ch#26 ( Centre Freq 514) 8Mhz Bandwidth with following channels in the bouquet. Ch# 29 ( Centre Freq 538) 8Mhz Bandwidth with following channels in the bouquet. Do you know the main feature of this technology that the DVB-T2 transmitter broadcasting signals through the air which can be received by the simple antenna or aerial, with multi TV channels? So, if you tuned to a single DTT frequency then it is possible to receive more than 1 channel on the same frequency. Which types of equipment needed to receive DVB-T2 signals? If you have an old analog TV set then you have to buy a Digital DVB-T2 set-top box to receive signals. You can connect this set-top box by using AV cable or HDMI cable depending on the input of your TV set. If you have integrated Digital TV set (iDTV) then you no need to buy any device because it is already has integrated DVB-T2 chipset. Yes, it is true now you can watch digital TV in your Smartphone’s, If your mobile already have integrated DVB-H chipset then you no need to buy any device but if your Smartphone does not have DVB-H chipset then you can buy DVB-T2 USB dongle and download related application from Google Play store to watch DVB-T2 channels on mobile. In this process, you do not need to activate any mobile data. In Computers / PC you can install DVB-T2 card or Capture Cards, you can buy DVB-T2 USB dongle and install supported software to watch live TV on laptop and PC. You can also record Live TV programs using DVB-T2 software. Yes, again it is true that now you can watch DVB-T2 digital TV channels on moving cars and buses. Few installations and specific devices required for this facility. You have to buy a iDTV enabled device which can connect in your Car LCD system or you can buy LCD separately. How to Install DVB-T2 channels in your home? First, you have to see that where you want to receive DTT channels like old analog TV sets Smartphone’s, Laptops and Cars. You can install a normal antenna at your home or on your roof depend on signal quality in your area. 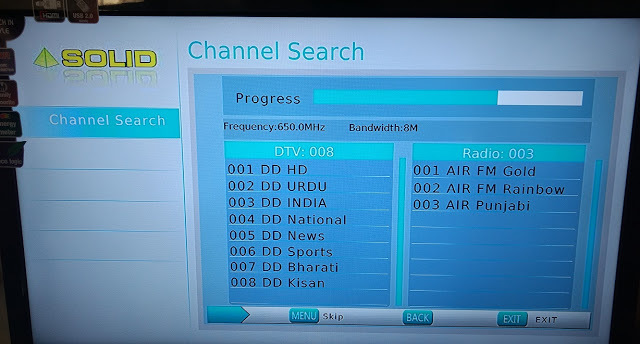 First, you should check that Doordarshan which band is using for DVB-T2 signals for example if Doordarshan broadcasting DTT service in your area using VHF band then you need a different antenna or if Doordarshan is broadcasting DTT service in your area using UHF band then you need a different antenna. After choosing DTT antenna you should buy good coaxial cable and shielded connectors improve signal reception. If you are living in a rural area then you can buy Digital VHF/UHF amplifier to improve signal quality. If you have any query regarding this, then you can ask your questions by the comment. Do you know why Doordarshan is going into digital terrestrial broadcasting? Bihar mein signal milega ka?